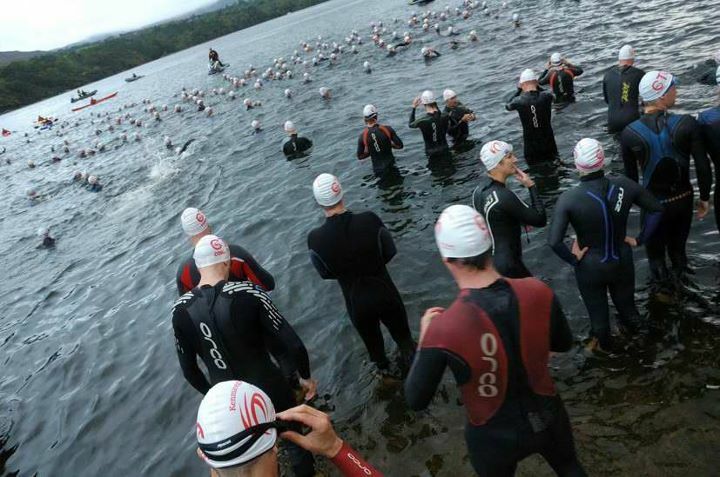 The Vodafone Triathlon Ireland Middle Distance championships took place in Kenmare on Saturday 17th September. The weather conditions were changeable to say the least with frequent heavy showers and strong winds making racing difficult at times. A high quality field lined up at 7.45am at the pier in Kenmare. In the men’s race, Owen Cummins led from start to finish. First out of the water in 22.03minutes he consolidated his lead on the bike with the split of the day (2hrs18.57) and finished the race in a time of 4hrs13.03 to take first place. The fight for second and third place was less straight forward. Owen was followed out of the water by Mike Yelverton and Philip King. Eric Wolfe, Mark Nolan and Kevin Keane weren’t far behind and Aodh O’Neill exited the water some 8minutes after the leader. Kevin Keane, Mark Nolan, Eric Wolfe and Aodh O’Neill all recorded fast bike splits and Mark Nolan was first into T2 in pursuit of Cummins. He was closely followed by Eric Wolfe but super-quick Aodh O’Neill ran his way into second place with the fastest 21km run of the day, 1hr16.13, five minutes faster than the next fastest, Mark Nolan who finished in third place. Aodh’s finishing time was 4hrs17.13 and Mark’s was 4hrs18.21. Eric Wolfe (4hrs20.38) and Kevin Keane (4hrs25.10) rounded out the top 5. The event was followed by the now infamous post-race party in the Brooklane Hotel. This year a raffle was held for athletes and marshals with prizes supplied by the Kenmare Bay Hotel, the Brooklane Hotel, Rocketscience Sports (http://www.rocketsciencesports.ie/home/), Runworx, Prego Kenmare and Sailfish. Cork Tri Club would also like to thank the race sponsors for their support- Xterra Wetsuits, The Edge Sports Shop, Dream Ireland Holiday Homes, Kinetica, Jam and Sailfish Triathlon. A special thanks to Ivan Kelleher (Race Director) and his crew of willing helpers and marshals who gave up so much of their time to ensure that the Lost Sheep 2011 was such a success.